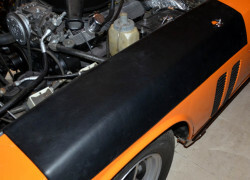 Item description: A pair of fibreglass covered wing protectors to fit Jensen FF & Interceptor. The P/S protector with hole for aerial. 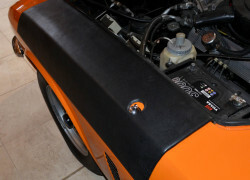 The protectors are manufactured in fibreglass, with a padding and black vinyl exterior finshing. The base has a material finish to protect the car’s wings. The wing protectors just drop into the gutter on the engine-bay side, and drop down the side of the wing for additional protection.